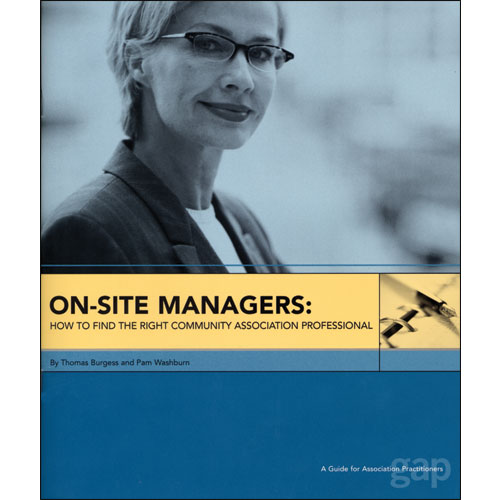 Has your association grown large enough to consider hiring a full-time manager? How should you go about finding a good one? You'll find answers to both of these questions in this guide. Contains valuable resources for determining job criteria, finding and screening candidates, and investigating leading candidates. Appendices also include a sample employment agreement and the CAI Professional Manager Code of Ethics. Who Needs an On-Site Manager? The U.S. community association industry has grown exponentially in recent years, from a total of 10,000 community associations in 1970, to more than 260,000 in 2004. Many of these associations are what's known as large-scale associations, and they cannot function effectively without a full-time, on-site manager. Manager turnover within community associations can be high if boards hire the wrong type of manager. If the fit isn't right, talent is wasted and organizational energy is dissipated. Hiring the right one requires a specialized approach. Hiring a new manager gives associations an opportunity to assess the nature and scope of the managerial position that best meets the needs of the association and to define the qualifications a candidate must have to achieve the association's vision. Board members must prepare adequately to conduct a manager search including establishing a schedule, involving homeowner committees, budgeting for the process, and arranging interim management during the search. Professional certifications, designations, and licenses (where required) are essential qualifications in a large-scale, on-site manager. Applicants should be screened carefully to ensure they possess the necessary qualifications and pass all background checks. The hiring process is a two-way transaction-not only is the association looking for the best candidate, but highly qualified managers are looking for the best associations as well. The board will have to sell the association to top candidates. Interviews serve a number of purposes, provide important information to both parties, and should be conducted systematically in order to evaluate candidates equitably. An agreement that lists all terms of employment should be prepared by the associations' attorney, negotiated with the top candidate, agreed to, and signed before the new manager's first day on the job. Document each stage of the process and keep all applicants informed of the association's progress. Ensure the association's success with the new manager by establishing performance criteria, delegating appropriately, and honoring basic distinctions between boards, managers, friends, and employees.